but it's better than a flashlight under the blanket. When I was a young kid, I loved to read, but I had an early bedtime. Simple technology resolved the conflict: I read under my blanket with a flashlight. When I was about 10 years old, I employed more advanced technology to outsmart my parents. There was a closet near my bed, and in the closet was a light activated by a pull chain. I tied a string to the chain, and tied a tennis ball to the other end of the string. I could read with the closet light and when I heard my folks approaching to perform a nocturnal inspection, I yanked the cord to turn off the light, threw the ball and string into the closet, hid the book under the blanket and shut my eyes. The old people never caught it on. Later on, while sleeping alone, a lamp on the night table easily solved the problem. While sleeping with others who did not want to be disturbed, an "Itty Bitty Book Light" was a good solution. Two years ago I bought an iPad, which combined reading material AND a light, and made wife and me happy. Barnes & Noble sells books, Itty Bitty Book Lights, and the Nook e-book reader. The company recently conducted a study which revealed (SHOCK!) that two thirds of Americans read in bed and that 50% would read more if reading did not disturb their partner. 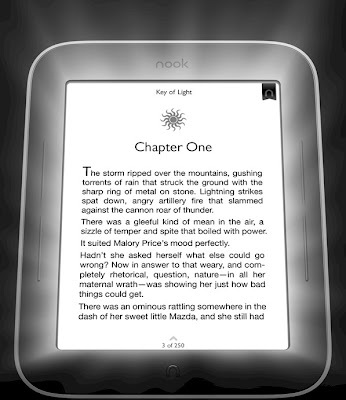 With an understandable desire to increase reading, B&N instructed the Nook wizards to make a Nook that works in the dark. 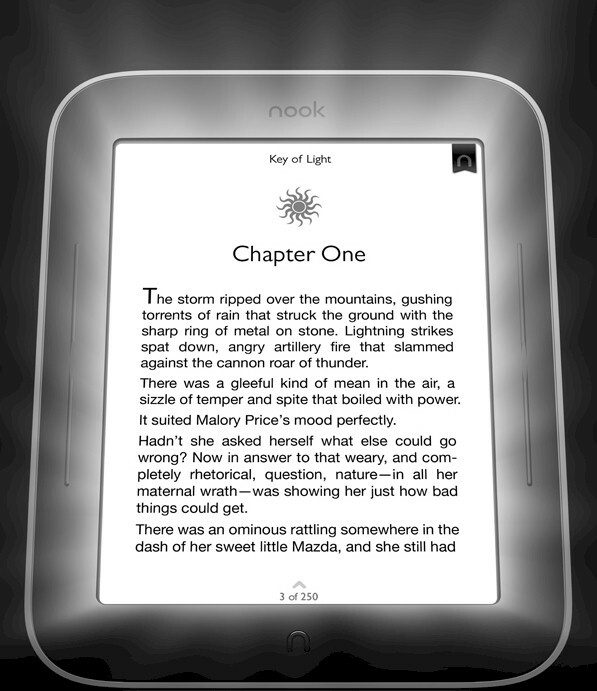 The result of the wizardry is a device with a tongue-numbing name: NOOK Simple Touch™ with GlowLight™. It's apparently the "World’s First and Only E Ink®Reader That Lets You Read in the Dark." The $139 price is forty bucks more than the unilluminated model. Forty bucks is much more money than the price of flashlight, but the new Nook is certainly more convenient. It's also much less expensive than an iPad (with many more functions). It is also less expensive than the $169 Nook Color and $199 Nook Tablet -- which do work in the dark but don't use E Ink. With a soft, adjustable glow, GlowLight gives bedtime readers just the right amount of light for reading -- without disturbing a sleepy bedmate. Unlike my iPad, the new Nook works fine in the bright sun. B&N says it's "Like having two Readers in one." What I will call the "Glow Nook" to save space is also the lightest Nook, with a long-lasting battery for over one month of reading on a single charge with the light on and over two months with it off. A Glow Nook can hold more than 1,000 books, and it has expandable memory. You can order a Glow Noo" at www.nook.com and in Barnes & Noble stores. Glow Nooks should be in stores starting in early May, in time for Mother’s Day, Father’s Day and graduations. It’s easy to navigate, shop and read with just the touch of a finger on the Glow Nook's 6-inch touchscreen. Touch to turn pages, look up words, highlight passages, read your way by adjusting the type size and style and more. You can shop B&N's huge digital bookstore with more than 2.5 million books, magazines and newspapers and enjoy helpful recommendations from book experts, personalized based on favorite authors, as well as those from friends, and borrow digital books from public libraries. For as long as there have been beds, and books, there’s been a common clash between couples at bedtime: Lights on, to read? Or off, to sleep? “The Barnes & Noble Nook Bedtime Reading Debate,” a survey conducted March 1-5, 2012, polled 1,358 adult readers across the country about their reading habits, and shed new light on this age-old challenge. •Bed Heads: Approximately two-thirds (64 percent) of people polled read in bed, and nearly a quarter read in bed between five and seven days a week. ◦People who own Readers are among the most likely to read in bed (72 percent) and are more likely to read in bed on a weekly basis than tablet owners (61 percent vs. 54 percent). •The Gender Divide: While reading in bed is a top pick for both genders, there’s a distinct divide when it comes to second place: women are likelier than men to read outdoors (40 percent vs. 25 percent), and men more frequently read in the bathroom (41 percent vs. 26 percent for women). •The Light/Dark Debate: 77 percent of survey respondents say they or their partner requires light for their bedtime reading, although nearly 90 percent say their ideal sleep environment is completely dark. ◦Men are far more likely than women to report their significant other disrupts their sleep by using a light to read in bed. •Keeping Peace: 50 percent of respondents say either they or their partner would read more in bed if it didn’t affect the other person’s sleep. •Sleepus Interruptus: A partner using a light to read in bed was deemed most disruptive by respondents – even more than a frisky partner’s “midnight moves.” ◦31 percent of respondents noted that a partner’s use of a light to read in bed interfered with their sleep or prevented them from falling asleep, while 20 percent noted that romantic overtures did the same. •Perturbed Partners: Nearly half (42 percent) of survey respondents have gone to sleep annoyed because their significant other was reading with a light on. •Night Flight, Not Fight: 42 percent of people surveyed say they or their partner has physically relocated to another room to read to not disturb the partner who wanted to sleep, as most also agreed this was the best way to “keep the peace.” ◦The “lights-on” breach of bediquette leads many to throw in the towel when it comes to sleep with flipping on the TV, leaving the room to read or staying up to read themselves the most frequent alternatives.